On Wednesday, we were fortunate enough to have the Head of the NMPAT Duston Centre, Giles Liddiard, visit us for an Assembly. He wowed us with his trumpet playing and explained how brass instruments work using a garden hose and a plastic funnel! 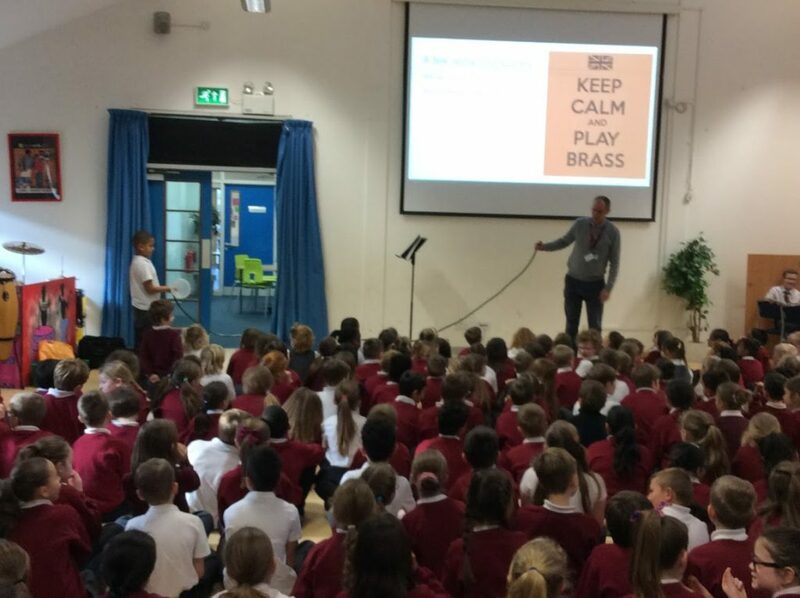 We spotted lots of excited and engaged faces – so if your child is keen to start a new instrument let us know as we have a couple of spaces for individual brass tuition available. Saturday the 19th of January is in fact an open day for ALL of the NMPAT Music centres around the county. All of our pupils are welcome to drop in to any of the centre sessions and try them free of charge. This is not just available to pupils who are learning an instrument, each centre has classes for beginners too. Many of the centres, Duston included, have shorter sessions suitable for pre-school, Reception and Year 1 students. Children who are in Year 2 and above can access the full timetable.